All over the city of Portland there are fantastic views of Mount Hood. Council Crest. Rocky Butte. Mount Tabor. Waterfront Park. The list goes on. The view of Mount Hood from Portland, actually protected by the city in the 1970s and again in 1991, makes for one of the most unique horizons from a downtown anywhere. But there’s one vista that’s been eluding me for years. I’ve been meaning to take it in ever since it became accessible in 2006, but for one reason or another, I haven’t. On Friday, however, I finally did. We took advantage of an unseasonably warm and sunny afternoon and headed to OHSU to ride the tram up to the top of Pill Hill. Just $4 for a roundtrip ride, the tram offers a smooth though swingin’ trip 3,300 feet up the hill. 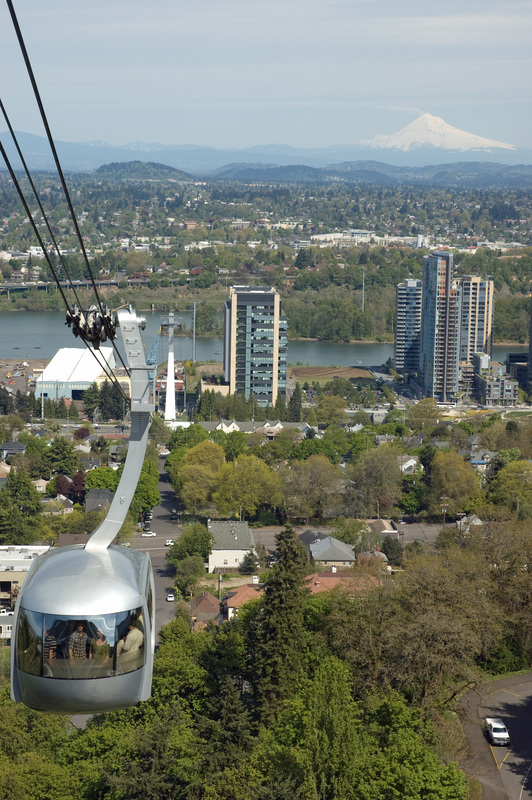 It cruises at about 22 miles an hour, takes about three minutes to make it from one end to the other, and offers incredible views of Portland, the Willamette River, Mount St. Helens, Mount Adams, and, yes, Mount Hood. A view worth taking in, for sure. This entry was posted on May 14, 2011 by onmounthood. It was filed under Uncategorized . What an amazing photo! Portland is on my list of must-visit places and this just confirms that. Thanks for checking it out, Alison. Portland is definitely a must-see!